In 1961 David E. Davis graduated from Case Western Reserve University with an MFA. One of the region’s most celebrated artists and the recipient of the 1980 Cleveland Arts Prize, Davis has been described as a “high modernist… keeping faith with ideas of beauty, aesthetics, and timeless universal content.” He spent nearly forty years creating a large, impressive sculptural oeuvre distinguished by its pervasive quality, variety, visual intelligence, and originality. 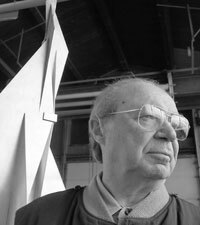 The consistency of his sculptural achievement is attributable partly to his unflinching adherence to certain philosophical principles (such as respect for materials), maintaining intellectual control over the creative process, and developing extensive permutations of a visual idea over a long period of time. He pursued some motifs for more than a decade, as reflected in the eight major themes of his sculpture: Open Forms, Growth Bands, Walking, Harmonic Grids, Tetrahedrons, Arches, Gates, and Sound Towers.